Sargo's Subs franchise business opportunity. 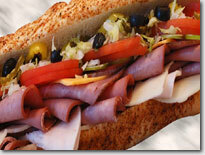 Free Sargo's Subs business franchise information. Sargo's Subs franchises are located in <?xml:namespace prefix = st1 ns = "urn:schemas-microsoft-com:office:smarttags" />Lake Oswego, Oregon. Our food and sub franchises continues its growth through impressive outlet sales and new development. Subs are enjoying an unprecedented growth rate, outpacing other segments of the restaurant industry. Sargo's believes it has a better concept for fast food. Not only does Sargo's use all quality product, it also uses our proprietary bread recipe. We are a healthier alternative than fast food - yet have the convenience and affordability. We also carry a full line of Italian coffee, espresso, and smoothie's. Sargo's in store franchise is complemented with catering and delivery opportunities. Presently, there are Eighteen Sargo's Subs franchises located throughout California, Oregon and Washington. This Food franchise concept is primed and currently accepting new individual franchise applications throughout the U.S. Master and Area Development franchise opportunities are also available with a minimum $100,000 liquid capital required. Come join us and experience the fast pace exciting ride of our rapidly growing restaurant franchise. To learn more about the Sargo's Subs franchise opportunity, simply complete the form below.